Two carved poppies either side of the central roundel. Text type (e.g. hand-written, GRU tags, carved): GRU tags. Excised carved lettering. Raised lettering on wooden circle plate, poppy placed beneath circle on shaft. This is a unusual style of cross with three, three pointed finials around circular plate. the main shaft is shaped at the bottom and then set in a block of wood. Circle plate (if celtic type) Unable to measure central roundel. Mounting to wall: Stands on wooden shelf fixed to wall with retaining chain on shaft. Detailing: The top of the shaft and the ends of the cross piece are carved into fleurs de lys with bevelled edges and some carved line detailing. The central roundel also has bevelled edges. The carved lettering and poppy designs are excised rather than incised. Evidence of use in field (earth marking, cracking, staining, shrinkage): Very slight evidence of possible staining at the base of the shaft. The cross sits on a later wooden pedestal which carries a plaque telling its story. Looking at the cross in detail, it is possible that it was reworked at some time after it was initially made to add the fleur de lys end pieces and the central roundel. 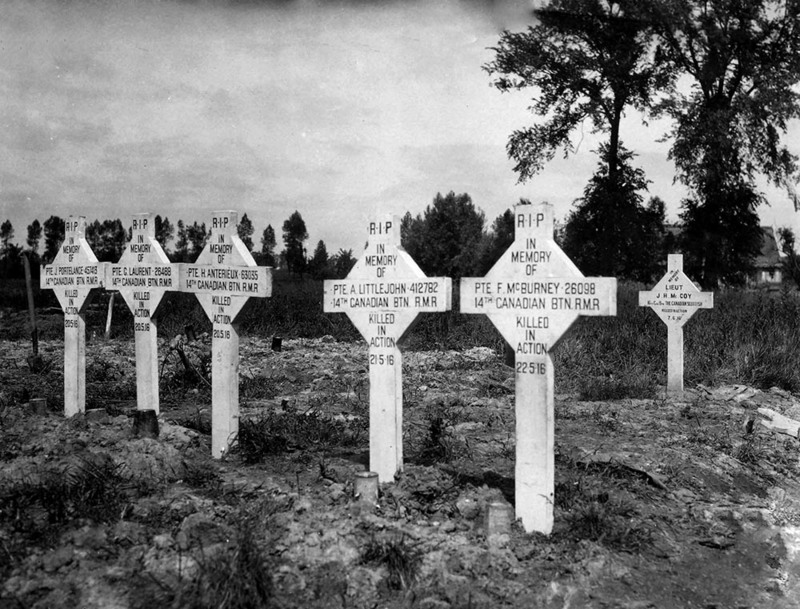 Poppies were not usually used as symbols of remembrance until after the war. Condition (cracked, paint peeling, woodwork, damage etc): Fair, some cracking and evidence of repair. 2nd Lt William Alexander Stanhope Forbes (always known as Alec) was killed leading his platoon in an attack at Guillemont Wood shortly after 12 noon on September 3rd 1916, zero hour. This occurred in the first 50 mins of the attack. He is buried at Guillemont Road cemetery, Guillemont, Somme. Grave ref I.A.1. He had arrived in France just nineteen days earlier on August 16th and joined his battalion on August 22nd. 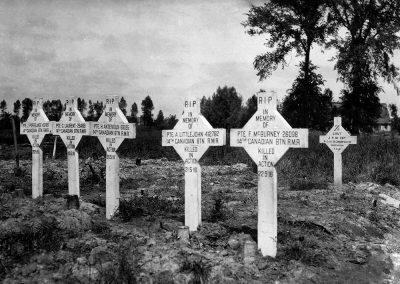 Proportionately, junior officers suffered some of the highest casualty rates of the war. Below the cross on the wooden base is a plaque detailing “This cross was erected in 1917 by an R.E. COMPy at Guillemont, Somme on the spot where LIEUt W.A.S. Forbes fell and was buried. When later that district was captured by the Germans it was only slightly damaged and was found on the battlefield when our troops finally drove the enemy back. Moved to the neighbouring cemetery in 1920 it is now replaced by the regulation stone slab and was brought to this church in 1925. Next to the cross on the wall is a beautifully carved bronze plaque of W.A.S Forbes framed in carved stone and marble. Born at Paul, a few miles from Sancreed, on May 26th 1893, Forbes was sent to Bedales School in Sussex which unusually for its time was a liberal coeducational boarding school, and later went to the Architectural Association in London. He was a skilled drawer winning the Guilford prize (Jnr Div) for his work on Architecture. Read his full history on the Bedales website bedales.org.uk it is well worth a read. His father, Stanhope Forbes RA, was a well-known artist of the time and a founder of the internationally regarded Newlyn School of painters. He made the bronze relief on his son’s memorial in Sancreed church; his signature is just visible in the bottom left hand corner. The relief is housed in an elaborate marble surround with the badge of the Duke of Cornwall’s Light Infantry and a passage from the book of Genesis at the top. At the centre of the foot of the frame is a boss depicting the instruments of an architect which Alec would have become had he survived. He was the son of both Stanhope and Elizabeth Forbes of Higher Faugan, Paul. Alec came from a family with a long an close relationship to the railways. His mother Elizabeth Armstrong also an artist was born in Ontario, Canada. He was their only child. and was a skilled drawer winning the Guilford prize (Jnr Div) for his work on Architecture. Read his full history on the Bedales website bedales.org.uk it is well worth a read. There is another large plaster relief in the church which may also be by Stanhope Forbes. He later went on to paint one of the more well-known pictures from the Great War, The Munition Girls. He is buried in Sancreed churchyard. 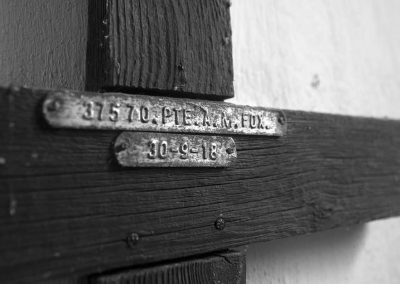 Slightly unusually for a small rural community in far west Cornwall there are two other connections to battlefield crosses of the Great War. Also buried in Sancreed churchyard is Florence Carter-Wood who committed suicide in 1914. At the time of her death she was unhappily married to Alfred Munnings who later painted Flowerdew’s Charge, a highly stylised and inaccurate picture of the action in which Gordon Flowerdew was killed and for which he won the VC. 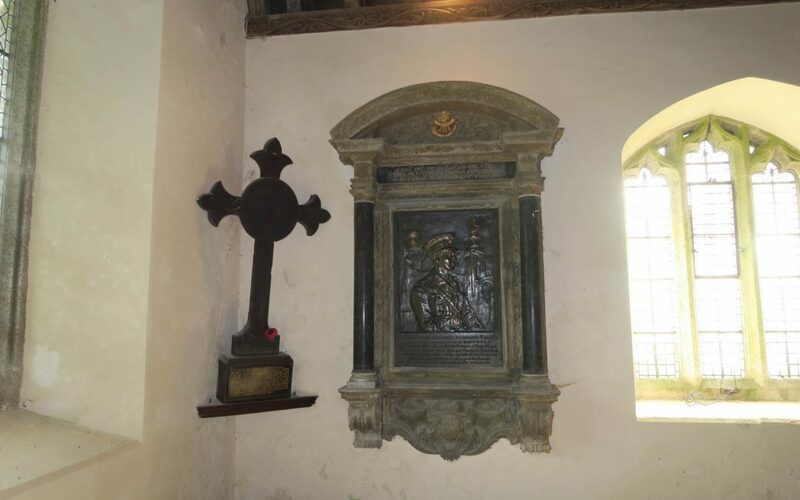 Just down the road in the village of Paul where Alec was born is the church of St Pol de Leon which contains the memorial east window to W T M Bolitho whose battlefield cross is in Gulval church a few miles away. 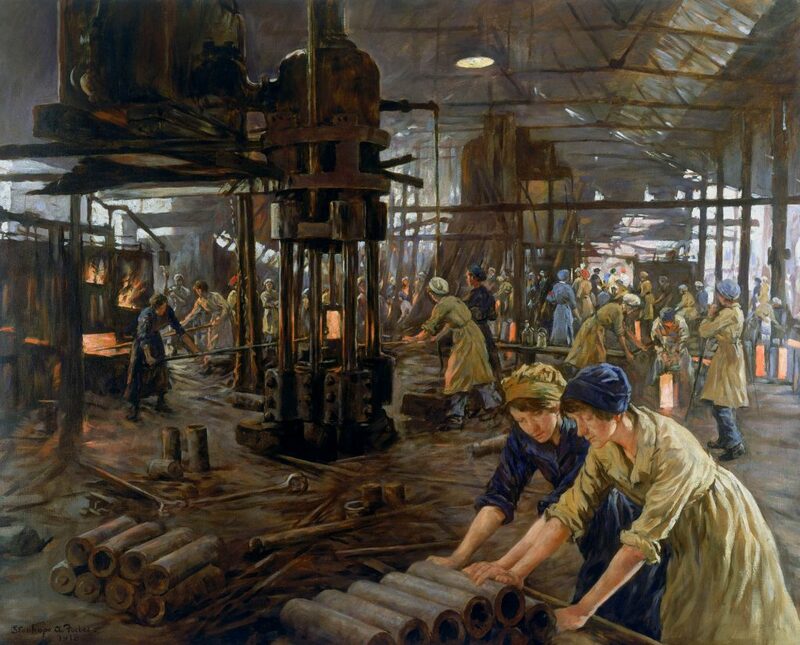 L0059548 Stanhope Forbes, ‘The Munitions Girls’ oil painting, England, 1918, Credit: Science Museum, London. Wellcome Images. Like many other steelworks during the war, John Baker & Co’s Kilnhurst site was converted to make shells and ammunition. 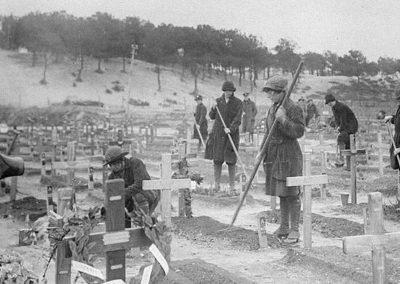 As men volunteered or were conscripted to fight in the British Army, women became the main work force in industry and farming. Munitions workers could often be picked out in a crowd because of the distinctive yellow colouring of their hair and skin caused by the sulphur used in production. They were nicknamed ‘canaries’.